*Mirror Stage I.—the infant, the mirror, & the nature of the image. The infant becomes transfixed by-with the ‘total form’ in-of this specular image of the body, then, which mimics their own movements. —The infant(/subject) recognises—(that is) validates and identifies itself with—the image. —It seeks to struggle free of the constraints presented by the adult (—the parent/guardian/carer), or its walker/carrier. *—The ‘total form’ of the image of the body in the mirror, however is a fiction. *… —The mirror stage represents an attempt to wrest (the fiction of a) fixity-stasis (—peace and security) from the chaos of an underlying (—pre-linguistic and (therefore) pre-egoistic—?) flux of movements: of and within the subject (—psychological and bodily), and in(-within) its environment (surrounds-environs). *… —I want to look at, and to try to define, the nature of what initially at least, appears to be a pre-linguistic and pre-egoistic flux; the nature of, and relationship between the ‘illusion’-mirage and the ‘ideal’; and what, finally (if anything) might be said to precede the mirror stage and to prompt it. … —Over on(-in) the main thread of this blog: *—The fold of the Artist, which I’m adapting from material from my doctoral thesis on artistic inspiration and the figure of the artist in the works of James Joyce and Friedrich Nietzsche *(—in an extremely pretentious and foolhardy attempt to develop my own theory of art), I’ve already posted some work-material looking at some of these questions. *… —the work I’ve already done, then, might help frame the way I want to read ‘The Mirror Stage’ (—the mirror stage) here, and, in a way,… —reading Lacan might help me (finally) to finish (or, at the very least, to address some of the issues and problems I had with) my doctoral thesis. … —examining the intellect, language, ‘intuition’, and account of the fiction of the ‘I’ in (—from early to later) Nietzsche. … —examining ‘analysis’, language, ‘intuition’, and flux in Bergson’s philosophy. What I’m interested in here are the… parallels (for want) in the accounts of language,… —thinghood (so to), and subjectivity (—the “I”. … ) as fictitious (—artistic, after a fashion) projections… —impositions of order on the underlying flux of an undivided continuity of ‘states’, between Nietzsche, Bergson, and Lacan. —I’m interested in the question of what it is that *prompts these… impositions. *(—and so,… —I’ll adapt-be adapting here, some material from my doctoral thesis, as well as some material which I wrote (from the point-of-view (so to) of my protagonist) for my first novel: Notes of a Vanishing Quantity *(—which I’m still trying, and failing, to publish, and which my thesis and its adaptation in this blog, are intended as a kind of a… companion piece), and which I earlier adapted for the blog for an ‘ early C20th political writing’ reading group of which I was a part under the title of: ‘towards an Ethics of Friendship’. … ). —This, I hope, (in ways that I want to come back to and to clarify and develop later) will lay the groundwork for a reading of Lacan on ‘primary narcissism’ in (-of) ‘the mirror stage’. PART I (then).—on the infant, the mirror, and the nature of the image in ‘the mirror stage’. the human child at an age when he is for a short while, but for a while nonetheless, outdone by the chimpanzee in instrumental intelligence, can already *recognise his own *image *|as such| in a mirror. *[N.B. … —I’m going to indicate my own emphases in the quotations here in bold,… —first in order to highlight what I believe to be the key terms which need to be unpacked and understood, and, second, to help distinguish them from the author’s own emphases. … ]. (i) —as an identification (—understood particularly as: recollection, recall, or remembrance): … —the action, or the process, then, of recognising or being recognised. In particular,… —identification of a thing or person from previous encounters or knowledge. (ii) —in the sense of acknowledgement or acceptance (—admission, and (/or) concession). … (that is)—acknowledging (—the acknowledgement of) a thing’s existence,… —validity, and (/or) legality. *… The subject’s capacity *(and I’m intentionally dropping the gender bias in-of the source text here), that is, then, to recognise: *—to identify with, and to admit the validity of, the image in-of the mirror’s-mirrored surface… —the image of themselves,—as exactly that. —the ‘intelligence’ that it points to is concerned with something quite other, and—apparently—more significant (… —of more moment… —?). This recognition is indicated by the illuminative mimicry of the Aha-Erlebnis, which Köhler considers to express situational apperception, an essential moment in the act of intelligence. (—the first moment of the… fixing (-in-place) of discrete things… *—and of (the sense-awareness of) a discrete “I”, —in relation to one another. …). *(—in what sense though (an)—‘illuminative mimicry’… —? —an illumination which mimics (—which mimics the ‘Aha Erlebnis’) (hmm…), or,… —a mimicry which illuminates, …—? —the ‘mimicry’ in-of the image-reflection. this act, far from exhausting itself, as in the case of a monkey, in eventually acquired control over the uselessness of the image, immediately gives rise in a child to a series of gestures in which he playfully experiences the relationship between the movements made in the image and the reflected environment, and between this *virtual complex and the *reality it duplicates—namely, the child’s own body, and the persons and even things around him. Lacan goes on to describe this (importantly, I think) as an *‘event’. [the child] overcomes, in a flutter of jubilant activity, the constraints of his prop in order to adopt a slightly leaning-forward position and take in an *instantaneous view of the image in order to fix it in his mind. *—‘prop’: an adult (parent/guardian/carer), or walker/carrier. *the ‘mirror stage’ is a—‘moment’,… —an instant, an ‘event’,… a ‘complex’, … and the movements, play, and struggle for freedom (or perhaps, rather,—independence) of the infant, stem from a desire to *hold and to *incorporate that ‘moment’, and the image itself. the transformation that takes place in the subject when he *assumes [assume] an image—an image that is seemingly predestined to have an effect at this phase, as witnessed by the use in analytic theory of antiquity’s term “imago”. (ibid.). —this recognition is followed by (or, perhaps, coupled to) an assumption of the image by the subject, and this assumption itself represents a transformation of-within the subject. *—‘The jubilant assumption [assumption] of his specular image.’ … (—ibid.). (—apparently this also applies to other kinds of wave, but we’re concerned with light here, so: onward … ). 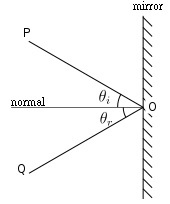 … —thus the angle of incidence equals the angle of reflection (—θi = θr in the diagram… ), and the incident, normal, and reflected directions lie in the same plane (—a flat surface which extends without end in all directions): are coplanar. And it is this simple, unified (—apparently self-identical) image that the subject thus attempts to assume. manifest[s] in an exemplary situation the *symbolic matrix in which the I is precipitated in a primordial form prior to being objectified in the dialectic of identification with the other, and before language restores to it, in the universal, its function as subject. *—THESIS – ANTITHESIS – SYNTHESIS. … —the in-itself, the for-itself, and the in-and-for-itself. —becomes both subject and object. (—I hope that that all makes sense. … —is that right… —?). *(—I want to come back to this notion-idea of the ‘ideal’ shortly here, and what I think it means. … ). this form situates *|the *agency known as the ego|, prior to its social determination, in a *|fictional| direction that will forever remain irreducible for any single individual or, rather, that will only asymptomatically approach the subject’s becoming, no matter how successful the dialectical syntheses by which he |*must *resolve|, as I, his *discordance with his own *reality. —It acts to place or to ‘situate’ the ego in the sense that the “I” is what Lacan calls the ‘root-stock’ of all the identifications which will come after—be ‘secondary’ to—it. *(—see 76). *—The ‘direction’ in which the ‘ego’ is thus placed, however, is *—‘fictional’. —The image directs the subject toward a fiction (… —? ),… —orients in a ‘direction’ (—a trajectory, of sorts) that is itself, then, fictional-a fiction. *—I want to come back to the notion of a *(—fundamental) discord between the subject and their ‘reality’, floated here, later, but note that such a resolution of discord is mooted here, by ol’ Jacques as a sort of ethical imperative (—‘must’). … ). the *|total form| of his body, by which the subject anticipates the maturation of his power in a *|mirage|, is given to him only as a *gestalt, that is, in an *exteriority in which, to be sure, this form is more *constitutive than constituted, but in which, above all, it *|appears to| him as |the *contour of his stature| that *freezes it and in a symmetry that reverses it, in opposition to the *|turbulent movements| with which the subject feels he *animates it. —what it presents, then, is the ‘total form’ of the body—as unified, and as self-identical. *—That is (as I understand Lacan here),—the subject attempts to appropriate the ‘total’ unity of the image of their body (—to extend the reach of the unity and stasis of the shape of the image) to their psychic life,… and it is this attempted appropriation (—identification) that constitutes the “I”. *—The image, however—precisely as gestalt, idealised and ideal… —is a fiction: a ‘mirage’. —The fiction of the ‘total form’ (of the body) with which the subject identifies is constituted in and by ‘mirror stage’, rather than itself constituting (or engendering) the ‘mirror stage’. What is constituted-created here, then, is an anticipation in-within the subject of its eventual coincidence (—co-incidence, so to) with the ‘total form’ in-of the image of the body—as an image of its potential(-possible) ‘power’. * … —the ‘power’, that is (—I’d argue) to be able to ‘freeze’—to fix or to hold itself (so to), as the apparent ‘total’ or ‘gestalt’ ‘form’ in-of the image of the body is held-fixed—against the ‘turbulent movements’—what I’ll refer to-call here the *flux—of its actual psychic, physical, and temporal experience. —Importantly, I’d argue, Lacan plays again here on both the possible meanings of that term. *[—I probably should acknowledge and emphasise that, as was the case with the term ‘recognition’ (above), I’m relying on the use of the term in the English translation here, but, certainly in the case of ‘mirage’, I think this reading holds for the original French term. … ]. (i).— an optical illusion,… —a… vision,… hallucination,… phantasmagoria, apparition, fantasy, chimera, or trick. These are often caused by atmospheric conditions… for example especially the popular (clichéd?) example of the appearance of a sheet of water in a desert or on a hot road caused by the refraction of light from the sky by heated air. And/Or, … (ii).— an unrealistic hope or wish that cannot be achieved. *… —The mirror stage represents an attempt to wrest (the fiction of a) fixity-stasis (—peace and security) from the chaos of an underlying (—pre-linguistic and (therefore) pre-egoistic) flux. … —and—and at the same time—as revealing an ‘ontological structure’ in-of the human world’. *—As I mentioned in my introduction to the reading group, I’ve only taught on Lacan,… —I’ve never actually engaged, in-depth, with his work in my own studies – thesis. Nevertheless,—… for a while, I’ve had a… sense (sic) that Lacan *(and, in this instance, his account of the mirror stage) actually frames the problems, philosophical questions, ideas and concepts I found myself drawn to and working on in Nietzsche and Bergson (as a way of framing my reading of the aesthetic theory in Joyce’s early fiction, and Modernist aesthetics and poetics more widely … ) more clearly and in-with more depth, and that (therefore) the work I’ve already done might help frame the way I want to read ‘The Mirror Stage’ (—the mirror stage) here.